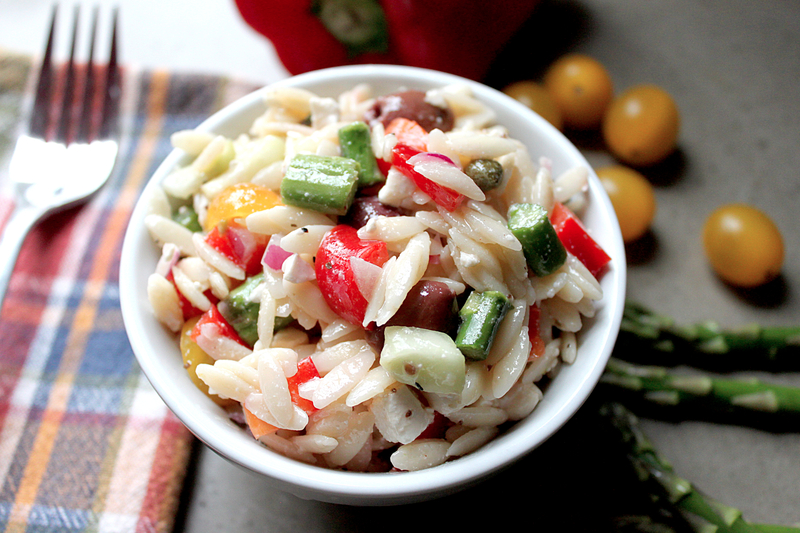 One of my favorite salads ever is this Mediterranean orzo pasta salad, a recipe that was given to me by my good friend, Ashley, at my bridal shower a few years back. Mediterranean flavors have always been some of my favorites. 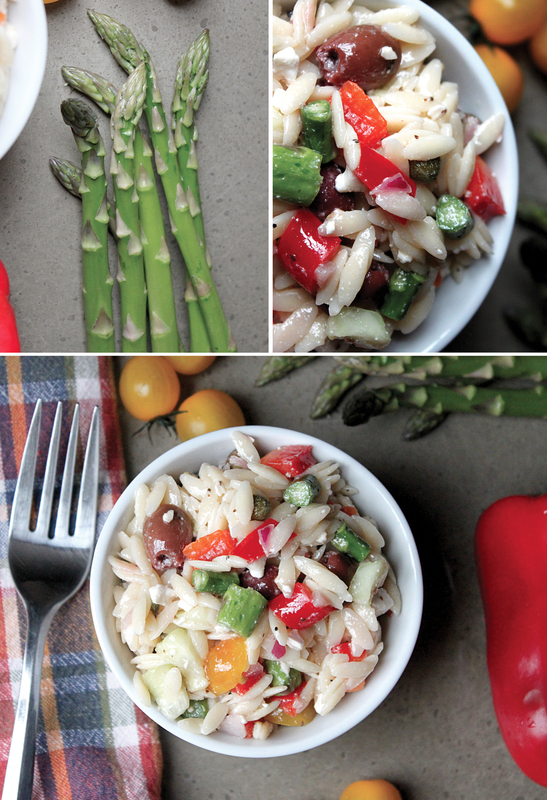 The combination of feta, kalamata olives, capers, and fresh vegetables gives this pasta dish a light and healthy appeal while being absolutely delicious! It has become my go-to for large group and outdoor gatherings. I can’t tell you how many compliments I get when I make this salad, it’s definitely a winner! Thanks Ashley!!! Recipe after the jump. xoxo! Cook orzo, drain and run under cold water to stop the cooking. 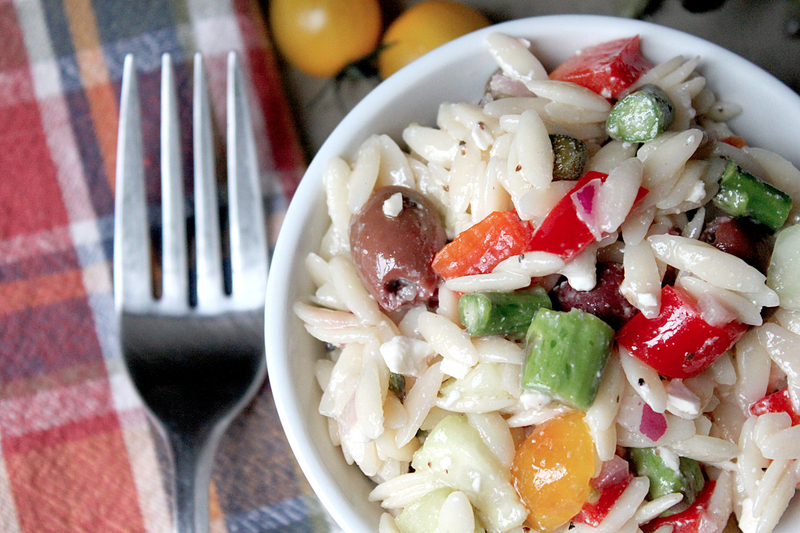 Once orzo is completely cool, mix all ingredients in a large bowl and season with salt and pepper to taste. Voila! This is a great recipe to make ahead because it only gets better the next day after marinating in the refrigerator. Enjoy! P.S. the original recipe calls for 1 diced avocado but I omit it because I’m allergic. You’re allergic to avocado? I’m so sad for you! I’m pinning this for summer. I know. I always hear that from people. Luckily, I don’t like the taste much so it’s not a huge loss for me :) Hope you like the recipe, it’s my absolute favorite. love this recipe!!! i love the combination of ingredients too! That looks amazing! I’m totally going to try it! Thank you :)!! Let me know how you like it! That looks delicious! I definitely want to try making it. Becca, I hope you do make it, it’s really tasty and so simple, plus you can practically feed an army with one batch! I see capers in the salad, and you mention them in the piece but I don’t see an amount listed in ingredients. Maybe a TBL or so? Hi, wanted to try this recipe but there is no measurement for the orzo. I’m not sure what size of box you are referring to. Sounds delicious though! A Spring-like Goûter « De quelle planète es-tu?